I just downloaded and installed it yesterday, and it is so slow, development has pretty much ceased. It takes several seconds just to switch editor panes. If I click on a file, to change to another file, it can take many seconds. Furthermore, it seems that the indexing spinner comes on constantly. I removed all my DerivedData from Xcode 6, and opened a single, very small, project using ObjectiveC only. I opened instruments, and loaded Xcode, then waited. After a while, Xcode "hung" on me again... I clicked on a file to change files, and it just never responded. Here is a link to the instuments trace. I've heard of people having performance issues, but I've never experienced something like this, even with an extremely large project, so I'm at a loss as to what I can do here. Remove any unsupported third-party plug-ins that you have installed. If you can still reproduce the problem, file a bug report (using the Report Bugs link at the bottom of this page) with the instruments trace attached. Thanks! I only had one plugin installed, and I removed it. I still see the behavior afterwards. 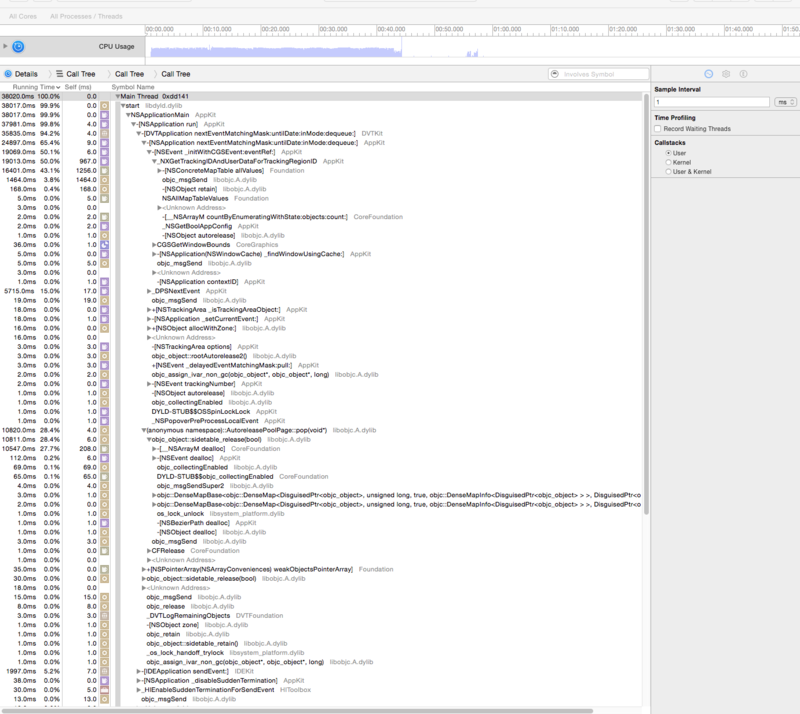 I added another instruments trace, which shows xcode spinning at >95% cpu for over two minutes before it switched to a header file that has 15 lines of objective c code, including blank lines and the 6 line comment block at the top. Also, I added a file with all xcode related entries from the console, and a spindump from a CPU warning also found in console. I included the console log for two separate manifestations. The log from today is filled with Xcode backtrace dumps. Basically, this one also causes the window server to peg the CPU as well, resulting in Xcode "going away" for long periods of time. 10/6/15 9:23:15.109 AM WindowServer: disable_update_timeout: UI updates were forcibly disabled by application "Xcode" for over 1.00 seconds. Server has re-enabled them. 10/6/15 9:23:29.111 AM WindowServer: disable_update_likely_unbalanced: UI updates still disabled by application "Xcode" after 15.00 seconds (server forcibly re-enabled them after 1.00 seconds). Likely an unbalanced disableUpdate call. I experienced another one, but this time it was very different in that the CPU pegged at 100%, Xcode became completely unresponsive, and I had to force quit. The system generated a spindump. I created a new bug report because it did not seem to be the exact same: 23040724. After the update to xcode 7 my productivity dropped down. Xcode constantly freezes. Dont know what to do. Same here and it's not about the hw performance, it must be xcode 7's problem. My machine is MBPR late 2013, 16GB ram, was okay with xcode 6. If you file bug reports, and share the ids of your bug reports, there's a much better chance that whatever you're running into can be addressed, or that someone would be able to offer suggestions for fixes or workaroundfs. See bug report 22892927. I've included a screen recording. There are two camps of Apple devs... those who have worked for Apple and say file a radar or gtfo... and those who have told me that it's a waste of time. I guess I naively believed your post... that filing a bug report may result in fixes, or suggestions, or workarounds. I spent a lot of time creating log files, instrument traces, and uploaded numerous helpful documents to my bug report. What did I get? A response on the bug telling me to disable third party plugins... which I had already done... and then when I responded with thiat piece of information, they CLOSE my bug report as a duplicate of another bug report referenced in this same thread (22860652). How do they know it's a duplicate unless they have identified the problem. It could be completely unrelated to the other issue. If they have identified the problem they could at least say so. I know it does not matter, because I'm just one developer, but this totally *****. What help will I ever get on this problem? I appreciate you and others at Apple helping, but all of you say the same thing... and few of us get any satifaction from filing bug reports. I expected something... maybe some work around or something... Xcode spins for MINUTES... I can't get anything done. I guess my only solution is to remove xcode 7 and install xcode 6. Would wasting one of my support requests even be worthwhile for this? I'd do it if I thought there was any chance it would get somebody's attention and get the problem addressed. I'm having the same issue. Xcode is horribly slow on my 2014 MBP with 16GM RAM. Xcode 6 was comparatively fine. Recently I did the upgrade to Yosimite + XCode 7.0, and also was very slow (horrifically at times). For me, I disabled Source Code (Never used it before - I do my own multiple probably OCD backups ) and for some reason it's enabled by default now? I just had a project open with no uncommitted changes and it was still doing it. Going to try disabling source control, but I'm really hoping Apple fixes this quickly. 7.0.1 is out, but there was nothing in the release notes about addressing performance. This really made a difference for me. My machine had not allowed me to do anything for 20 mins, disabled source control and it was working full speed again in seconds. Please keep me posted. My bug report was marked as a duplicate of yours... and closed. So, I guess I'll never hear anything again about it. I sure hope you gave the lots of information, because my report is closed which means I guess they will not look at all the extra information I provided. Just to add some information to this discussion, I have a very repeatable issue with tooltip rendering in the Project Navigator (files tab) in the Navigator (left) sidebar. Basically, if I move my mouse around in there over files, Xcode CPU usage spikes and after a few seconds (on a Retina MacBook Pro with an SSD) it renders a tooltip showing the full filename and then the CPU spike ends. If you hover over a lot of files (by momentarily spinning your mouse around a list of 6-8 files) Xcode will lock up for nearly a minute. I haven't (yet) reported a beg related to this, but I was wondering if I was alone in this or if anyone else can reproduce it. I've disabled source control and it has no effect on this particular slowdown. EDIT: It seems to go away with a fresh launch of Xcode. I'll post again if it happens again (it was not a 1-time thing, I've noticed it every day since I upgraded). I also intentionally left out the detail of me removing the two plugins I use (Alcatraz and VVDocumenter) before restarting. I didn't want my post to be dismissed out of hand as a problem with plugins. Xcode (plugin free) is choking as we speak. I'm running various instruments on it and saving the results. Currently, Xcode is still struggling with about 10 seconds of mouse jiggling (in the Leaks instrument so it's greatly affecting the speed). Between that sentence and this one, it finished. 10-20 seconds of circling the mouse around in the Project Navigator over the same 5 classes (5 .h, 5 .m files) took almost 17 minutes to become responsive again. For the duration of my mouse circling (not even clicking, mind you) Xcode was making allocations as long as my mouse was moving. The only time in the instrument that it flatlined on the way up was when Xcode froze and wasn't accepting more mouse events. I've also run the CPU time instrument, and the Counters instrument. Different runs, same behavior. Links to download the traces are below. While it's like this, are there any other instruments I should run? I tried to run the system trace one, but it froze, wrote and read a bunch of data to and from disk and then instruments crashed. The only things I've done with Xcode is run it since yesterday and do some development work with it (maybe 3 hours total that Xcode was in focus after my post). Also, just noticed this. Xcode will struggle if I try to rapidly switch between a few files (by clicking on them in the Project Navigator). It seems to wait for the source code coloring to finish before switching the next file every time. Maybe it shouldn't. Yep, it also seems to be related to the tooltips for me. As a workaround I've made the left pane wide enough to fit all my filenames so that no tooltips show, we'll see how that goes. Exact same issues for me as outlined above (I have a MBP Retina, running Yosemite and Xcode 7.0.1). Making the left pane wider seems to have kept the issue from cropping up so far, will continue to monitor. Would like to add that I've also noticed my Xcode 7 lag is simply due to the tooltips showing up on the left navigation pane. I've noticed this on three different machines (MBP Mid 2012, MBP Mid 2014, iMac Late 2012). I'm on the latest version of Xcode as of this posting (7.1.1). My only solution so far is to expand it so that no file names/folders get truncated. This is quite annoying and was not an issue with Xcode 6.4. Same thing - as soon as my mouse pointer passes over a file with a truncated name in the left-hand pane, the spinning wheel appears and everything stops for ages. Expanding the left pane so that the names are not truncated has fixed it. Looking forward to a proper fix from Apple. I have the same problem. Since Xcode 7 (even 7.1 beta) especially the UI performance is very slow. XIBs are taking very long to load suddenly. Just switching between code and views takes several seconds until I can start typing / doing something. I see the spinning wheel all the time. I have a MBP Mid 2015 16GB RAM. I am also suffereing from a very slow Xcode 7. It just isn't usable in this state. Clicking any button within Xcode, it takes at least one second for it to react. This time goes up if you click on more than one button in a short time. Working with Storyboards is impossible as it takes ages for you to search for the object you want and then when you finally have it, it takes ages to open up the panels you require for that object. I have a new MacBook Pro (15-inch Mid 2015) with 16GB RAM on OS X Yosemite (10.10.5). I was previsouly running Xcode 6 fine on my older MacBook Pro. So it turns out for me that the issue is something to do with my external monitor/graphics card. If I have the Xcode window open on my MacBook screen then it works fine. As soon as I move it over to my external display (which is where I always have it as its a bigger screen) then it just goes SUPER slow and becomes unusable. I have the same problem -- storyboard is extremely slow when displayed on external monitor. I have XCode 7.0.1 running on a new Macbook Pro. Hodson, were you able to submit a bug report? Xcode 7.0.1, specifically Interface Builder, is extremely slow on my MBPr 13" early 2015, i7 16GB RAM. I am also running on an external 27" 2560x1440 monitor. The interface becomes completely unusable. I can't even drag a view around in its hierarchy. It takes minutes for menus to update after clicking on anything. I've learned my lesson analyzing these serious bugs in Apple development tools. I've submitted extremely detailed bug reports previously, only to have them closed or ignored. These same bugs live on for years, never resolved. Moving the Xcode window onto the laptop's retina display and Interface Builder all of a sudden becomes usable, the CPU fan spinning down to normal. Interface Builder clearly has major issues when it comes to display scaling. In this case, it doesn't like the non-retina external display. Another serious bug I've filed a detailed closed-as-duplicate bug report on and describe in depth here, is caused by retina displays. It corrupts your storyboards, shrinking and shifting view frames. Yeah, I wish I could find something to help. I'm working directly on a 27-inch iMac, so no external display involved at all. Hopefully more bug reports will gain some attention to these problems as Xcode 7 is almost unusable (though this project I'm working on is investigating the recent core data changes, which requires Xcode 7). My MacBook has retina display and the problem was that when I put the Xcode to the external display (HP LP2475w) everything else worked fine except when I started on viewing/editing my storyboard the Xcode became very unresponsive and slow. The solution I finally figured out was to install SwitchResX app and change the external display resolution to one of the HiDPI resolutions (my MacBook has HiDPI resolution selected) -> Xcode works fine now even on external display. I'm working on a non-retina, Mid-2012 MBPro (16GB, 512GB SSD) and have been experiencing 30+ seconds of beachball action every time I interact with the storyboard. Along the lines of your suggestion, I toggled my screen resolution from the default to scaled to the same default 1440x900 resolution in System Preferences, and that seems to have helped. Still getting hesitation when going back and forth to the storyboard, but now only 3-5 seconds of delay. I noticed the very same issue - Xcode's Interface Buiilder becomes very slow, almost non-responsive, after opening a storyboard file on an external monitor. On the internal retina one it works just fine. Are you using an external monitor? Storyboard editing can be *very* slow if Xcode is displayed on an external monitor. Move Xcode to your Mac's integral display and performance will be fine. Not a solution but at least a work-around. Count me as another developer that is experiencing extreme slowness from xcode since upgrade. I usually have to restart xcode and it works okay for about 10 minutes then completely locks up. Either stuck indexing or just the rainbow spinny thing. I've tried destroying the DerivedData folder before restarting. I'm running this directly on a MacBook Pro - mid 2013 model. Xcode 6 worked perfectly fine on this, just since the upgrade this has happened. It is extremely frustrating and takes a toll on productivity. Hoping that Apple finds a solution for this. Thank you. There is not enough information provided in this conversation for us to be able to investigate further. At this point it's not at all clear that your separate "me too" reports are even about the same underlying issue. If it is important for anyone CCd to this conversation that we look into and resolve the performance problems that you are currently observing, please consider collecting the required performance data (sample / spindump / sysdiagnose) *while* you're experiencing the problem, and then submit that information to us in a new bug report. Thanks! For me the issue was XCode being stuck on indexing. After deleting the derived data of the project indexing finished and XCode became responsive again. Unfortunately this is only a temporary solution. XCode will eventually get stuck again while indexing. I hope this will be fixed soon, XCode is almost unusable currently. So, I never could make any headway. Xcode 7 kept spinning and spinning. I sent in spindups, instrument logs, console logs of all the many thousands of errors xcode was spitting out. In the end, I executed a clean install of El Capitan, and aside from issues related to El Capitan, I have seen no problems like I experienced before. Xcode is still slow, but nothing like it was previously where it would just go away for minutes at a time. I have recovered all my applications and such from Time Machine, so I have pretty much the same stuff (except I didn't re-install mousepose). I had the same issue and was able to fix the slowness by going into the projects window (from the Window menu) and delete the derived data from my project. I'm having same problem with XCode 7.1 on a Mac Pro Late 2013 with 8 Core CPU, 64GB Ram and 1TB SSD running Yosemite 10.10.5. Navigating through xib files, selecting one by one makes this XCode freeze become faster. While this freeze, only XCode freezes I can use other apps, so this is exactly not a OS X freeze. XCode 6.4 doesn't have any problem like this. I tried disabling and enabling I disabled Source Control as XyeKi suggest, but this didn't help. Any working workarounds to solve this problem would be appriciated! Open the Terminal window , then type the following code in terminal and click enter. Now restart your xcode and enjoy better performance. I have the same problem -- Xcode7.0 first opened very slowly in the open Mac, required 4~5 mins after it can be work. the simulater also extremly slow. (MacbookPro Retina 2014 , OSX EI 10.11.0 and 10.11.1). we need apple engineer help me to solve the Bug! why apple software increasingly unstable? I had found the solve method, I remove the unsupported third-party plug-ins then rebot, everything be OK! thank Apple engineer! XCode is horrible since version 7. Notice that it is getting slow over time. It seems like they are chaching some of the tabs while navigating through the tabs or w.e. The only way to speed it up is to restart it once you notice that it is getting slow (approx. every 10 minutes). > It takes several seconds just to switch editor panes. If I click on a file, to change to another file, it can take many seconds. Xcode 7 on my late 2012 MBP Retina spends about a second (non-scientific) switching between open file tabs. I instrumented it and found that Xcode is spending a lot of time laying out the UI for the file tree / Project Navigator. Sure enough, when I hide the navigator [cmd-0] or switch to a less expensive nagivator, like Find, switching between open files becomes nearly instantaneous. As an additional test, I tried showing the project navigator in each editor pane but with the tree fully collapsed. Again, the file-switch time becomes nearly instantaneous, so it seems the lag is proportional to the number of items expanded - or perhaps just visible - in the tree. P.S. I tried some of the other solutions mentioned in this thread, like nuking derived data, disabling source control, and disabling code coverage, but these didn't appear to have any effect on file-switch times. It seems likely that people are experiencing several, non-related performance issues. For me (El Capitan 10.11.1, XCode 7.1.1, MBP 2015 beast) happens when editing a storyboard on any external monitor (running two of them: 1920x1200 and 2560x1440). After switching to storyboard it becomes extremly/unusably slow. If I swtich away from storyboard it works fine - obvious a problem with the storyboard designer. It works fine on laptop's retina display. I'm also flabbergasted that Apple can't repro this issue. I stumbled upon this issue today. The external monitor setup with HDMI cable has the problem, with Thunderbolt 2 adapter to DVI has no problem. I suppose the answer to solve the problem might be making sure the connection cable is a good one. It seems the cable doesn't solves the problem. The reason might be left with the external monitor. It might be that Xcode makes layout calculations that are a bottleneck to the laptop's resources (I've got the latest Mac Book Pro at this moment). So the workaround is to be sure the monitor works well with your Mac or to move Xcode tot the laptop's screen. 7.3.1 really helped to resolve my speed issue. Confirm. Version 7.3.1 finally made it possible to work again. You could also try going into Window -> Project. And deleting all the old derived Data. This could help......But the newest Xcode has definitely sped things up. Also if you have a LOT of code in a single file, you can break it up using Swift Extensions. Both of these strategies greatly sped things up for me, but with 7.3.1 Everyting looks peachy once again! I can slow Xcode (7.3.1) to a crawl with a minimum number of steps. Maybe this will provide the clue that Apple's developers can use to fix the problem. In the mean time you can search for similar things in your code that you may be able to rework to avoid Xcode's serious problem. 3. Run the project. It takes an excessive time to build (90 seconds for me). 4. Remove or comment out any three lines, Clean, and run again. Now it builds and runs in just a few seconds. 5. Restore those three lines, and then duplicate them to add three more. Change their indexes to make the code valid. Now it takes many minutes to build (more than 17 minutes for me). Please Apple, would you consider looking at this test under your microscopes? Your best bet to have Apple see that info is to submit a bug report ("Report Bugs" link at the bottom of any page here). Xcode 7.3.1, El Capitan here. Absolutely abominable performance and we can barely work any more. Extremely dissapointed that Apple destroys their own hardware with each upgrade expecting us to return. Sorry to say, not this time. If your mac os is sync with iCloud just turn off the iCloud from the settings right now. It really helped me. I started to use Xcode 8.3 under Sierra and builds took forever. However, I noted one response above suggesting turning off source control. This immediately allowed builds to complete within a few seconds rather than many minutes. I am guessing that source control is not configured correctly but that is an issue for another time. Great when you find a remedy on first search.